Lunch boxes take a lot of punishment. They get smashed into backpacks. Their zippers get yanked. Their insides are leaked on and speckled with food. So, perhaps last year’s lunchbox is ready for retirement. When looking for a new one, think about what the kids (or you) like to eat. Do you pack sandwiches or something that needs a rigid container? Do you need to chill your lunch? Do you want pockets for napkins and utensils? Of course, style is important, too. We have highlighted pattern trends, including sequins, tropical animals and video games. Without a lot of effort, you can find a bag that blends fashion and function. 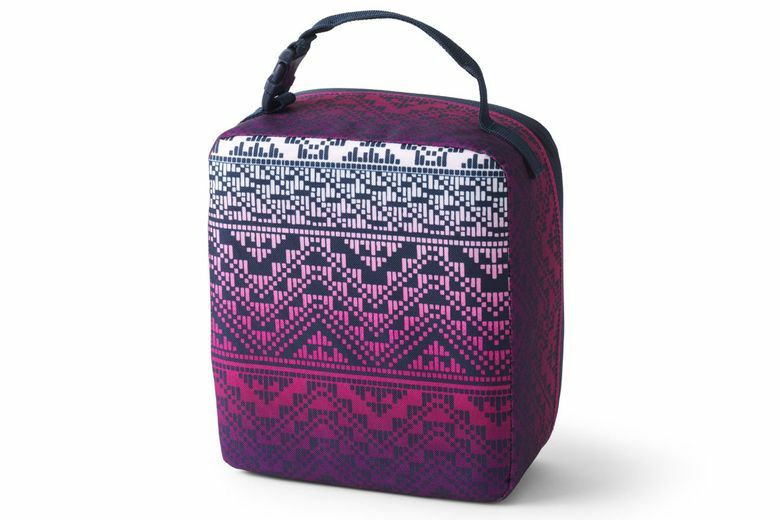 An Aztec print meets ombré (gradually blended colors) in Lands’ End’s ClassMate EZ Wipe Lunch Box (on sale for $19). The molded shape means your chips won’t get crushed. The inside is easy to clean. There’s also an outside pocket and clip handle. Also in solids and several other patterns. 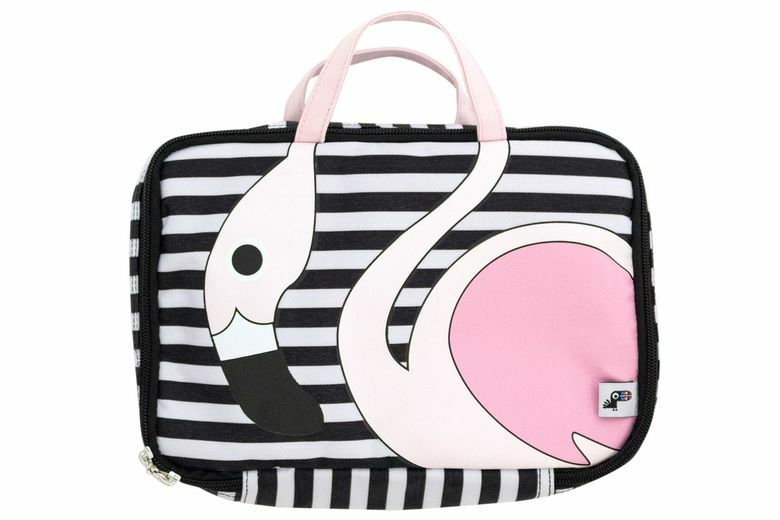 Yoobi pairs an eye-catching pattern with a rectangular shape in its Flamingo Lunch Bag ($13 at yoobi.com and Target.). The size and shape make it well-suited for bento boxes. It’s soft-sided with a double zipper and features an interior mesh pocket. Dinosaurs are gone, but dinosaur designs live on. 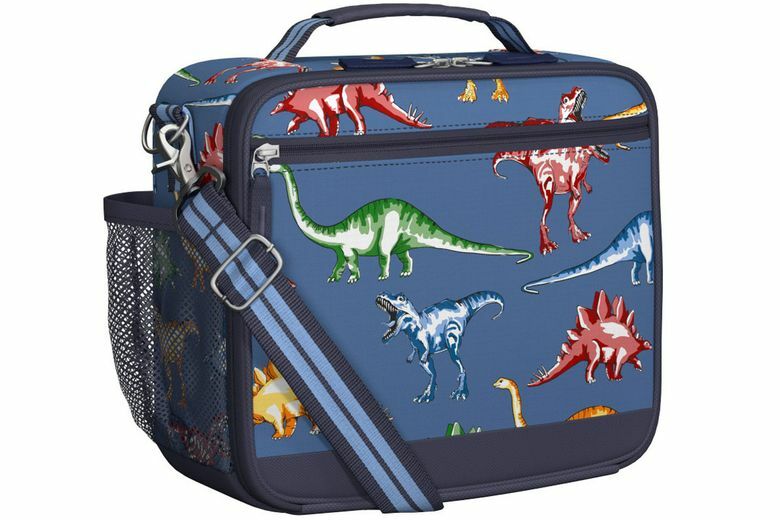 Pottery Barn Kids offers four dino patterns on its Mackenzie Cold Pack Lunch Bag ($29.50–$32.50). The large, insulated bag includes a soft freezer pack that velcros onto strips inside. There’s a zipped outside pocket and inside mesh pocket. The outside also has a mesh drink holder, a handle and a clip-on carry strip. Also in several other patterns. 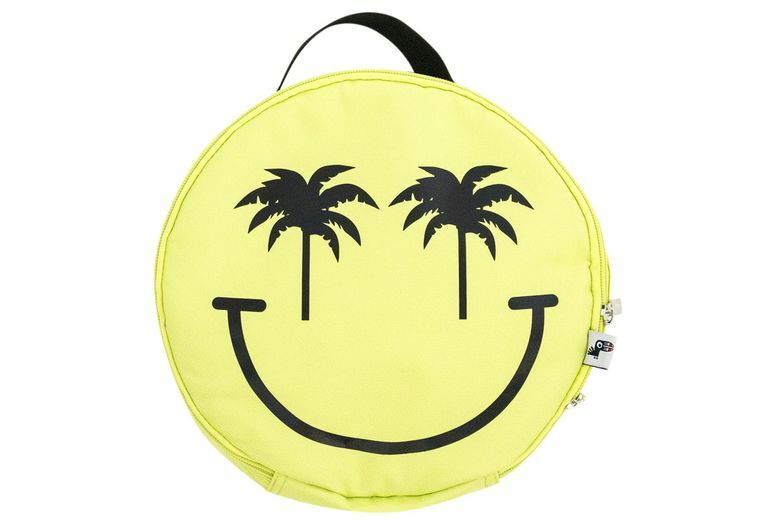 It would be hard to be in a bad mood with Yoobi’s Smiley Face Lunch Bag ($13 at yoobi.com and Target) in hand. The unusual shape is fun and the size is generous (nearly 10 inches in diameter), but make sure your food and drink containers fit inside. The insulated soft bag features a mesh inside pocket. 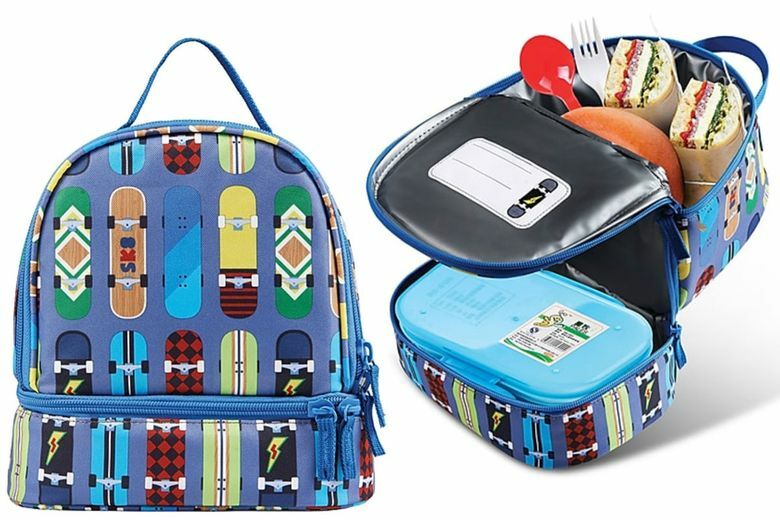 Skaters should check out the Staples Kids Lunch Bag ($10) in the skateboard pattern. The bag is actually darker than the one pictured, with a gray background and muted blue trim. The insulated bag features two zippered compartments to separate foods at different temperatures. No additional pockets. 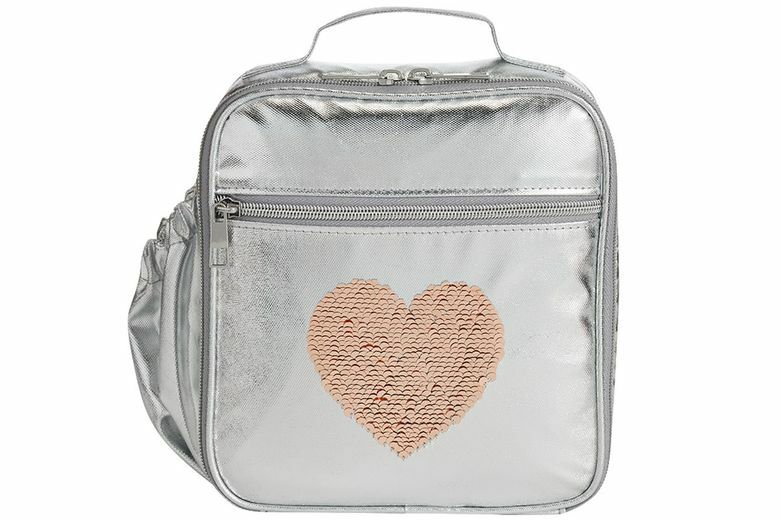 Sequins add sparkle to this Monique Lhuillier Silver Sequin Heart Lunch Bag ($24.50 at potterybarnkids.com). With a swipe of your finger, the heart goes from silver to pink or pink to silver. The insulated and waterproof bag includes an outside zip pocket and drink pouch. The molded inside is easy to keep clean. 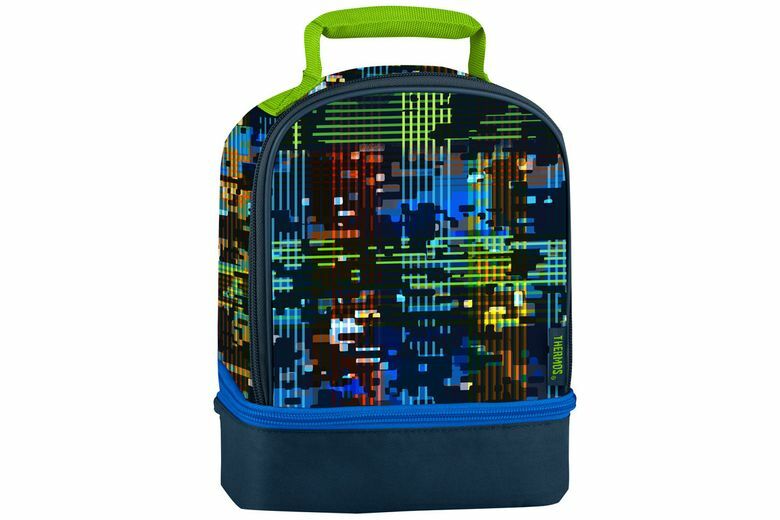 If you’re a gamer or coder, you might like the pixel pattern on the Thermos Fashion Dual Lunch Kit (on sale for $7.50 at Office Depot). The bag has two zippered compartments and a padded handle. This bag has thinner insulation than other bags, so if you are looking for a light bag, this also deserves a look. Also in pink. 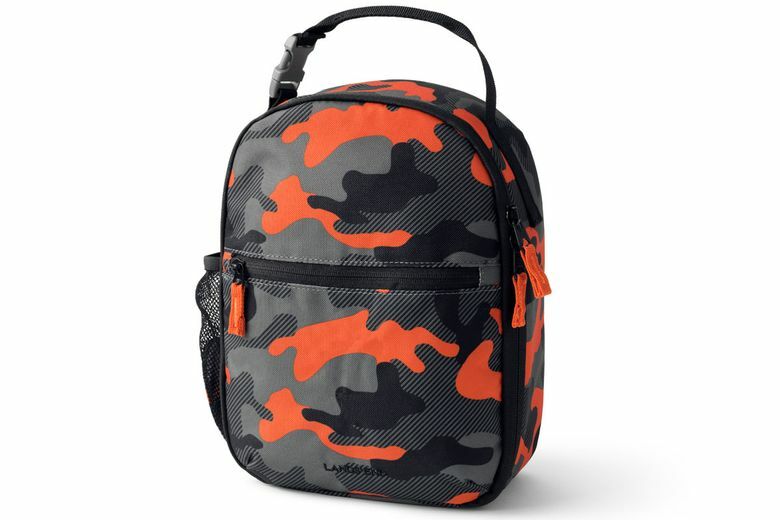 Camo gets a bold look with Lands’ End’s Classmate Printed Soft Sided Lunch Box ($20) in lava orange camo. The rounded rectangular shape is a sleek profile but wouldn’t be the best choice for large bento boxes. The bag includes an inside mesh pocket, outside zip pocket, clip handle and mesh drink holder. Also in solids and other patterns.